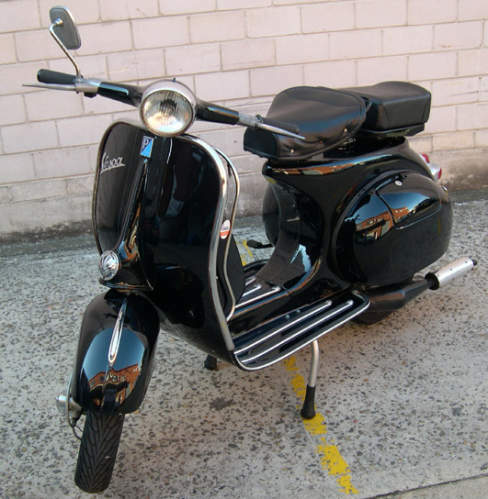 I purchased this scoot brand new from Gasoline (Darlinghurst) in 2005 and it has only 3500kms on the clicker. Relectant sale. The scooter has rego til Mar- 08 !!! This has been a full restore (sanded back to bare metal and re-spreayed) with a brand new 5 port reed valve engine (ie: NOT A RE-CONDITIONED MOTOR.....BRAND NEW ENGINE). Everything except the chasis is brand new! It also has an expansion chamber fitted (see pics) which increases power by as much as 20%. The chamber almost gives the engine a bit of a harley-type tone as well. The engine has pretty amazing compression and she goes. Have travelled at 110km/h with no problems.